Planning a science project involving plants gives you the opportunity to test results in an easily demonstrable manner. Though some may have done similar research in the past, you can usually find a way to make your project a bit unique. 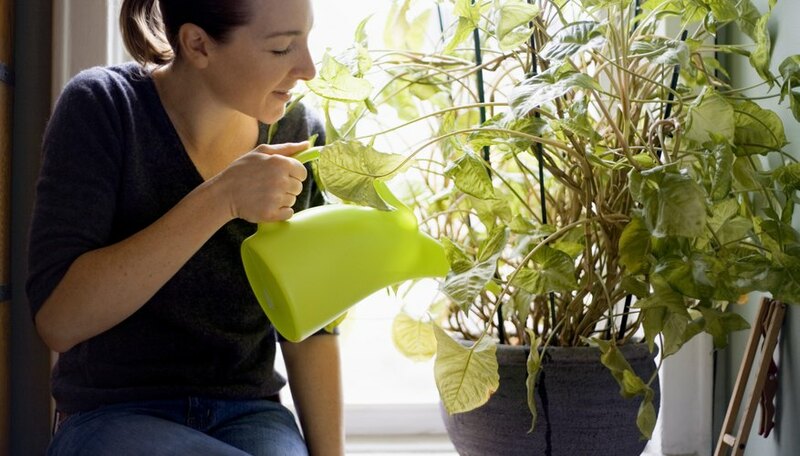 Everyone knows that plants need water to grow, but you can look at whether they'll grow better with water that has salt or sugar, by watering them with soda, water and Gatorade. When conducting experiments, it's important to keep everything except for the variables constant. Since you want to test the difference between soda, water and Gatorade, you must use the same type of plant, the same type of soil, the same potting, the same lighting and the same temperature for each. It's smart to have a few of each type of plant in case one dies or doesn't sprout for a reason unrelated to your watering technique. The most obvious way to measure results is to take a ruler to the base of the plant and measure how tall it grows. Depending on the plant you use, though, you might want to look at other elements, such as the width or abundance of leaves, size and taste of a fruit or vegetable, and root growth. For example, in a study on the effects of water with sucrose on orchids by Ruth C. Yates and John T. Curtis, presented in the American Journal of Botany, the plants that received sucrose had a deeper root system, but shorter shoots. You might see this in the plants you watered with soda. Consider a wider range of variables. For example, you might try including sugar water and salt water in your testing, or using a larger variety of plants. This will help you see whether the results you find are true across the board or are only true for the particular choices you made. Depending on the amount of time you have, you might start with pre-started plants, or start your own from seeds, wondering if this has any effect. Once you've found your results, design a board that allows you to visually show your results to those who attend the science fair. For example, if your results show that Gatorade causes lower growth rates, show pictures of those results. You could even bring in the actual plants so people have an opportunity to see with their own eyes. McCormick, Maggie. "Science Fair Projects on Plants: Do They Grow Faster With Soda, Water or Gatorade?" Sciencing, https://sciencing.com/science-fair-projects-plants-grow-faster-soda-water-gatorade-12305169.html. 25 April 2017.